Together with his mentor, Khrimian Hayrig, Bishop Karekin Servantzdian was a remarkable ecclesiastic who worked actively for the well-being of Armenians in their historical territories and even engaged in political activities. At the same time, he became a founder of sorts of Armenian folklore studies. Servantzdiants was born in Van on November 17, 1840. He studied in his birthplace, and then graduated from the seminary at the monastery of the Holy Cross of Varak, where he was designated as teacher. When Khrimian became the superior of the monastery in 1858, he resumed the publication of his paper Ardzvi Vaspurakan, which had initially been printed in Constantinople (1855-1856), and named young Servantzdiants deputy editor of the weekly from 1860-1862. 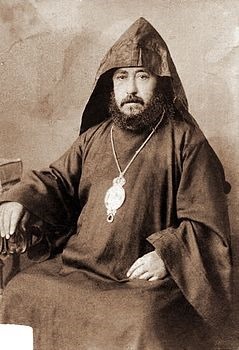 Khrimian and the future ecclesiastic toured the Armenian provinces in 1860-1861. Servantzdian depicted the painful situation of the Armenian working class, subject to exploitation by Turks and Kurds. The Ottoman authorities took him under surveillance. He also collected samples of folkloric texts and sayings. His initiative contributed to the opening of schools in various places. In 1862 he became principal and teacher of the seminary attached to the monastery of Surp Garabed in Moush, and edited another publication by Khrimian, Ardzvi Darono (1863-1865), a biweekly. In 1866 he published a textbook, New Reader, in Constantinople. In 1867 Servantzdian was ordained a celibate priest in Karin (Erzerum) and sent to Van as preacher. Soon he became general director of the schools of Karin, and two years later, he was designated deputy abbot of the monastery of Surp Garabed. While a champion of popular education and culture, Servantzdian did not shy away from engaging in more difficult tasks. In 1872 he participated in the foundation of the clandestine political group “Union and Salvation,” created in Van. He was designated vicar of the diocese of Van in 1879. Patriarch Nerses Varjabedian sent him to tour the Armenian provinces in 1879-1880 and prepare exhaustive reports about the situation of the population. At the same time, he also recorded many samples of oral literature and described rites, customs, and beliefs. By then, Servantzdian was actively publishing his findings. His book of 1874, Գրոց ու բրոց (Krots oo prots, loosely “From Written and Oral Sources”), consecrated his name as the discoverer of the Armenian national epic David of Sassoon. The young priest recorded for the first time an account of the epic, which has been regarded as one of the best among 150 recorded published and unpublished accounts. He published another book of written texts, From Old and New, in the same year. New books appeared in the next decade: Manna (1876), where he included folkloric material and the description of the neighborhoods and historical monuments of Van; Toros Aghpar (1879), where he spoke about the economic situation of the country, and the Armenian emigration; and With Taste and Smell (1884), which included a description of Armenian places, historical monuments, and weather, and also literary sketches of various figures of the past and popular tales. In 1881 Servantzdian participated in the organization of another patriotic secret organization, “The Black Cross,” and by order of the government had to leave Van. He became vicar of the diocese of Bitlis and then took the same position in Kharpert. He traveled to Echmiadzin in 1885 and was ordained bishop the next year. Then he was designated primate of Trebizonda and then of Daron, at the same time becoming abbot of Surp Garabed. Servantzdian’s patriotic activities and stance triggered the displeasure of Sultan Abdul Hamid II. Consequently, Patriarch Haroutioun Vehabedian (1885-1888) fired him from his positions in Daron and had him sent back to Constantinople. Under strict surveillance, he worked as preacher at the Holy Trinity Church of the district of Pera, teacher at the Getronagan School, and chairman of the Religious Council. His contributions to the fields of ethnology and archaeology earned him an honorary membership in the Imperial Academy of Archaeology of St. Petersburg (Russia). After a long illness, Bishop Karekin Servantzdian passed away on the day of his fifty-second birthday, November 17, 1892. His legacy became a stepping stone for the development of Armenian ethnology and folklore studies in the twentieth century.